This iExpression is a variant of the 'Throw 2D' iExpression in which the thrown object cannot only bounce of the ground but also bounce of some walls. There are two different walls available. Besides the position of the walls you can also specify how elastic the thrown object bounces of the walls. In case you need just one wall, you can simply choose for both walls the same position. determines how elastic the object bounces from the ground. 100% means that the object behaves like a bouncing ball, 0% means that it does not bounce at all. is the (x) position of the first wall at which the thrown object may bounce. This value should not be animated. is the (x) position of the second wall at which the thrown object may bounce. This value should not be animated. 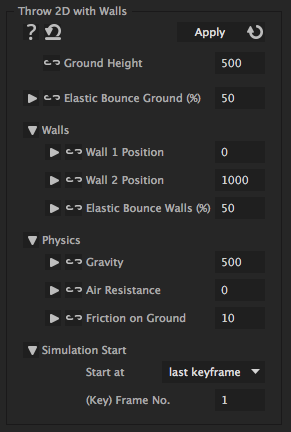 determines how elastic the object bounces from the walls. 100% means that the object behaves like a bouncing ball, 0% means that it does not bounce at all, but slides downwards along the wall.